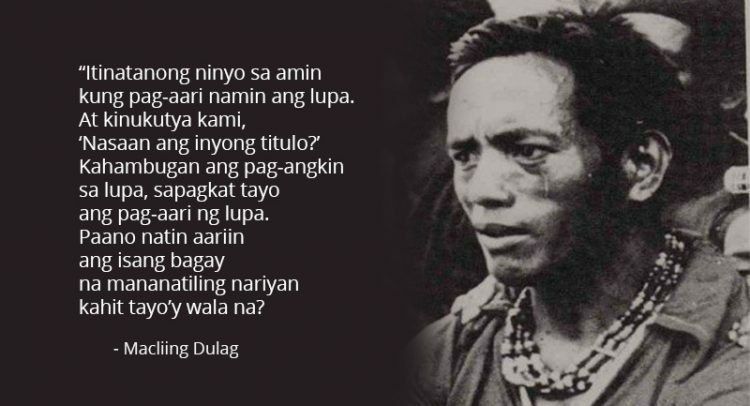 Year after year, as we commemorate the martyrdom of Macli-ing Dulag, we are faced with issues that would seem the same and that solutions seem to be remote if not possible to achieve. But just as our parents and their parents before them did, we face these issues as they bear upon the future generations of Igorots specifically and Filipinos in general. This gathering will surely name these issues as it did so in the past. Even as we do, there are several values of our identity as Igorots and people of the Cordilleras that we need to affirm. Chief among them is our rootedness on the land. The way we understand our relationship with the land could either be our sustenance as an indigenous group of our undoing. We are grateful that in the thick of the struggle to affirm that value. Macli-ing Dulag stated what it is: “Land is Life!” This we need to affirm time and time again as there are forces out there, including our government system, employing all means to break that relationship. Second, is our understanding of our culture as a way of life. Our culture is neither a thing of the past nor an obsolete value that does not find a place in this time and age. In fact, it is precisely for this destructive period that the values of our cultural practices were perhaps preserved for. All over the world, indigenous peoples are calling for a renewed reverence for creation. Our cultural practices speak not only of our songs and dances but also of our calls to go back to the good practice of community-affirmation and the sharing that characterize that community. This is the statement of the indigenous people against greed, covetousness and individualism. Third, is the need to continue struggling for the preservation of these values, not for preservation’s sake but because it is our particular contribution in the preservation of the human race. Systems and powers race for their perpetuation as if it was all that matters. In the process, they continue to degrade creation and make people suffer. It is not easy to stand our ground. In our days, those who do are labeled terrorists as a way of vilifying and as a license to oppress. Let us not be confused with terminologies and labels. Rather, let us remain focused in upholding our rights and dignity. May the God who inspires our mothers and fathers to ensure our survival today teach us to ensure the survival of the next generation.